If your microblogging activities are limited to the Identi.ca and Twitter services, Gwibber might be overkill for your needs. In that case, Pino is exactly what you need. 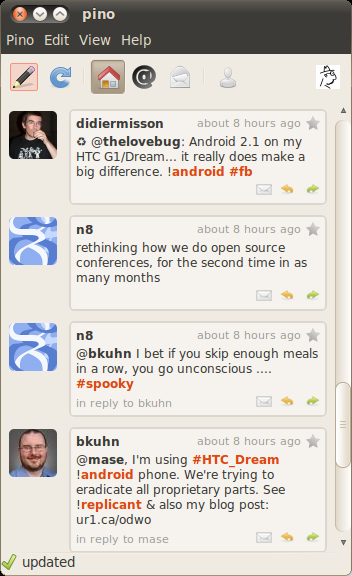 This microblogging client is lightning fast, and it's not overloaded with features you might never use. But it does support multiple accounts, URL shortening, notifications, and even spell checking. Running another Linux distro? No problem: the project's download page provides instructions on how to install Pino on other distributions as well as build Pino from the source. I'm afraid Fedora/YUM isn't half the community. Not nearly. But I do see your point. I don't think this is an issue for the author however, this is yet another cry for a unified/agnostic package management system for Linux. It would be nice if, when these articles posted installation instructions, they would include yum/rpm commands, too. It isn't very nice to ignore half the Linux community like that.